Do you love books? Do you have a house filled to the brim with books? Do you wish your furniture could also be made out of–or resemble–books? This is the time for you, as clever, literature-themed furniture is available for your home right now. Delicately crafted and painted to resemble hardcover spines and pages, these pieces take the fake-book-storage-box gimmick to the next level. 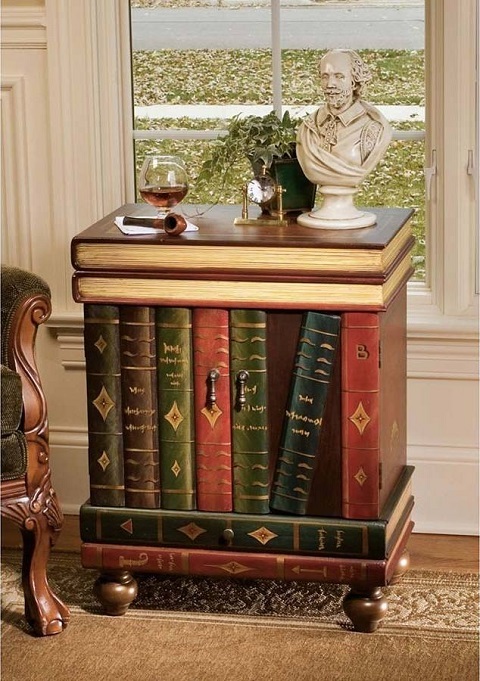 Whether you intend to trick and delight guests or make your home a love letter to your favorite medium of information, there is book furniture for you. If you’re an avid reader, chances are your home is full of stacks of books – whether it’s a pile on your nightstand or a tower next to your favorite reading chair. Instead of counting it as clutter, make it a decor choice: get an end table that only looks like a haphazard stack of books, but is actually a stable, balanced table. It’s the best of both worlds: something functional that’s made as a book look-alike. 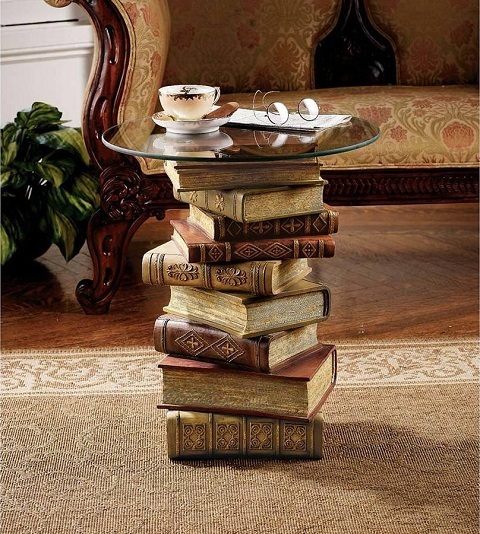 While some of these book-stack tables can look pretty realistic, the glass tops are perfectly safe perching on top. And you won’t have to worry about damaging an actual precarious pile of classic literature, and there is no worry when putting beverages on top. Unlike paper, these replica end tables aren’t super absorbent to wine spills and coffee stains and won’t have ruined text after an accident. One way you can take advantage of all this book-themed furniture is if you’re adding a reading nook to one of the rooms in your home, if you haven’t formally done that already. Pair these pieces of furniture with a good sitting chair, some ambient lighting, and quality wooden bookshelves and you’ll not only have a cozy, functional reading nook, but one that’s obviously thematically separate from the rest of your space. 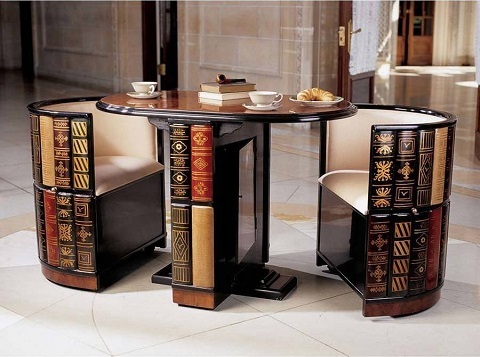 You can even cater how you decorate with books due to the range this mimicry furniture has. Some designs are more realistic, and others are whimsical and stylized – obviously, a real book wouldn’t have a dresser knob attached to it. 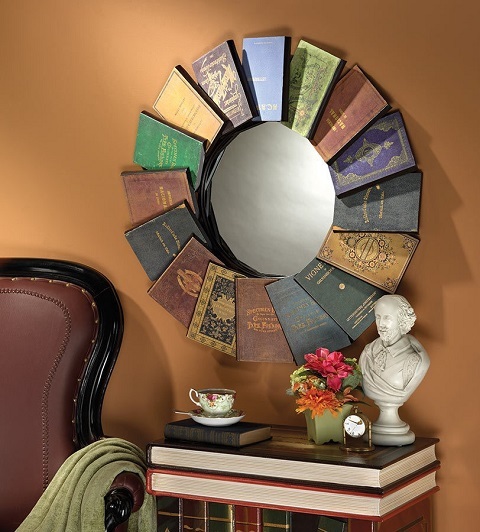 You can have book-shaped things as a fun little accent to your room or seriously commit to the illusion. The latter option is much more difficult, but you could get your start through upcycling book covers and using them to re-texture or disguise existing furniture or accent pieces. I know what you’re thinking: destroying actual books to make furniture instead of just mimicking them? It’s more practical than you think. A lot of secondhand stores and libraries sell off redundant or damaged copies of your favorite stories very cheap. If you’re not too keen on starting a craft night still, don’t worry: upcycling can be done many ways. Book cover art can be used as an accent piece on an accent table or in a curio cabinet in the same way fine dishware can be displayed, even using some of the same display holders. Overall, when you’re dealing with novelty furniture accents, you want the piece to be functional but out of the way. The best way to do this but still have fun with it is completely concealing the intended purpose of the furniture. 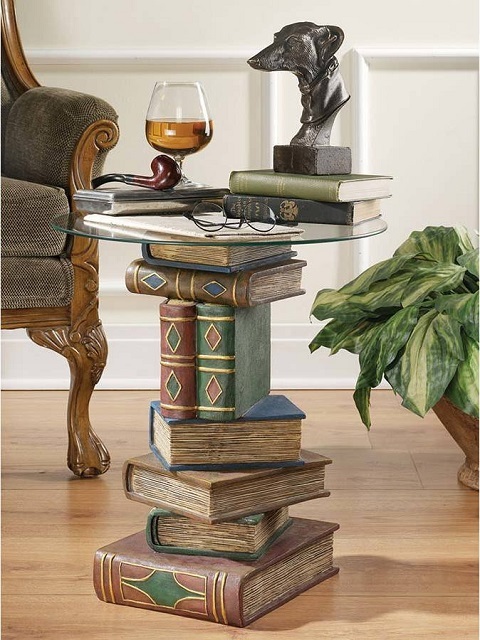 Imagine having a dear friend over and telling them to pull a chair out of a round bookshelf and have a seat. It’s a completely normal breakfast table, except with a little touch of book love imbued in it. 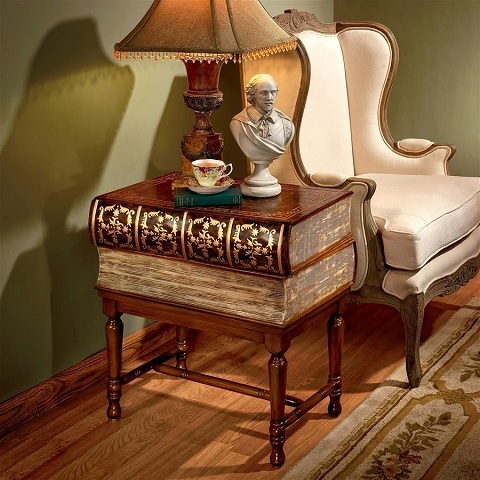 This entry was posted in Decorating Ideas and Tips and tagged books, end table, novelty furniture, side table.